Brett Goffin's Blog: Why can't I get a witness?? Why can't I get a witness?? This brings me to the recent Lebron-Witness Nike Commerical. In the commercial, there are a couple of quick shots of people wearing a plain black or navy blue shirt with the word "Witness" and a Nike Swoosh below. Pretty simple. I want the t-shirt. So, being the savvy web searcher/online shopper, I begin my quest...No luck at all online besides ebay (more on this below). I contact a few New York sports apparel stores...No Luck. I GO TO CLEVELAND (for business, not just for the shirt) and go to 4 stores there, including the actual store in "the Q" where the Cavs play their games...No Luck!! Apparently, Nike gave out those t-shirts as a Game 1 home play-off promotion. That's it. The store manager told me that I was at least the 1000th person to come in and ask for it!! When I told my buddy Dirk (who grew up in Cleveland) that I was looking for the t-shirt -- he had heard the same story from his friends. Apparently - these things are in high demand! So what is NIKE thinking?? It's not like they don't sell any Lebron gear. 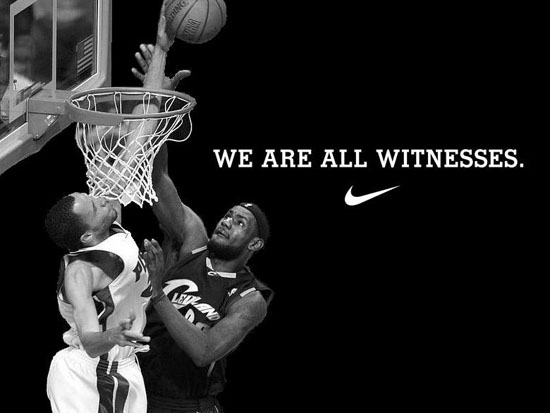 It's not like they're not running millions of dollars of ad spots supporting the Lebron-Witness campaign. And most importantly - it's not like the shirt itself isn't a walking commercial (which i'm willing to pay $20 for by the way). The shirts are currently valued at over $60 a piece on eBay. The clerk at the Foot Locker in downtown Cleveland told me he'd sell me his for $70. Apparently, there are a few street vendors that are selling a replica, but unfortunately the streets of Cleveland are fairly dead at 2 PM on a Wednesday, so none were out while I was there. SO...As of now, the quest is still on. If anyone sees the t-shirt, please let me know! Amy - Will you Marry me? What is Pat Riley Thinking?